Originally published by Union Presbyterian Seminary, here. 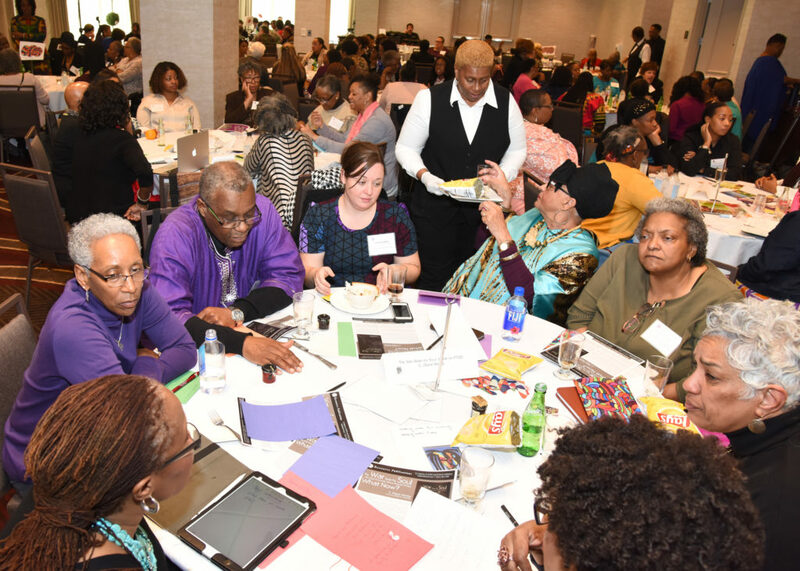 The Inaugural Gathering of the Center for Womanist Leadership held in Richmond, Virginia, April 5-7, 2018, exuded strong, savvy, spiritual power. 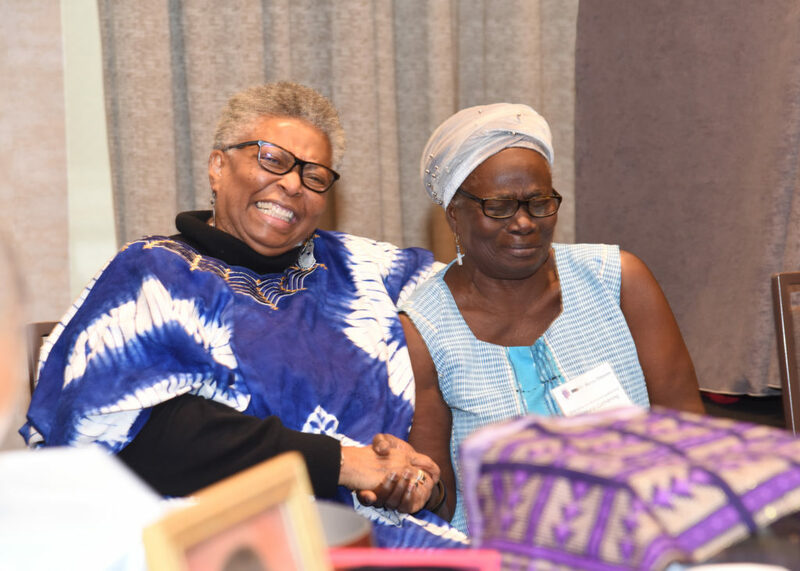 From the opening address by world-renowned author Alice Walker to the closing ritual when participants rendered homage to the elders and received their blessing, the gathering marked a signal contribution to women’s work in religion. 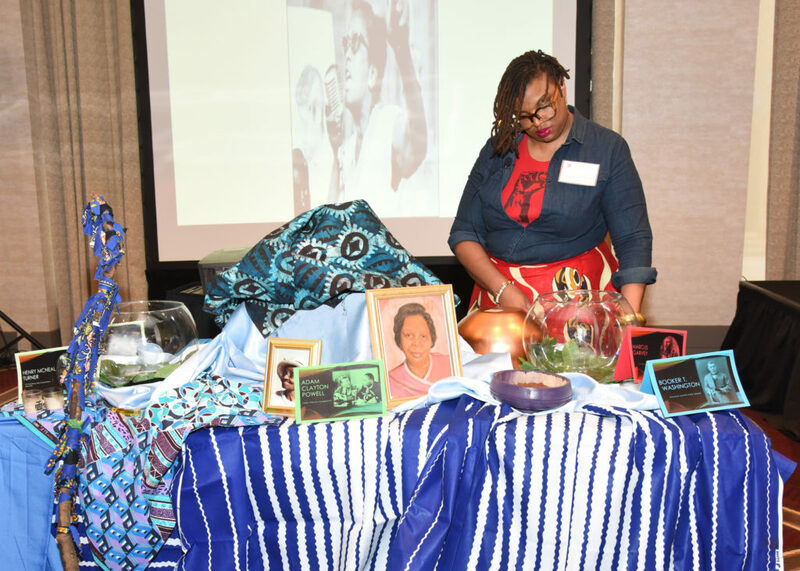 The conference, “Bearing Witness to Womanism: What Was, What Is, What Shall Be,” began with a free event that demonstrated a wide-open welcome to the local community. About 1,500 people turned out to hear writer and poet Alice Walker speak at Saint Paul’s Baptist Church where white-gloved ushers welcomed each person to the sanctuary as if we were family. That kind of broad audience appeal in a megachurch whose self-description is “A Church for People on the Grow!” set the tone — womanist work is from the community for the community. Alice Walker intoned many of the facets of that have come to characterize womanism: “We go nowhere without our people.” “Those who love us never leave us alone in our grief.” “Poetry is good for you.” Stellar music and a beautifully set stage added the clear sign that womanism has a complex and rich aesthetic. The next day, when 250 participants (numbers were capped by space at the sold-out event) convened, the responsibility to speak from and to a broader audience was already the norm. So, too, were many forms of artistic expression that leavened the weekend. I was one of a handful of participants not of African descent who were fortunate enough to be present. When the Rev. Dr. Katie Geneva Cannon sends a personal ‘Save the date’ –“Hope nothing will prevent you from being among the cloud of witnesses…” there is only one response — clear your calendar. Dr. Cannon, Annie Scales Rogers Professor of Christian Ethics at Union Presbyterian Seminary in Richmond, is the center’s driving force. Her vision for a place, both virtual and real, where womanist scholars, ministers, and activists (many are all three) can focus their energies is now realized with big plans ahead. Her work is emblematic of womanism, especially her books, like “Katie’s Canon: Womanism and the Soul of the Black Community and Black Womanist Ethics.” All participants received her wonderfully synthetic summary of womanist thought, “Remembering What We Never Knew: An Epistemology of Womanist Theology” that is now the center’s first official publication. She is held in the highest esteem by colleagues worldwide, her inimitable leadership key to the center’s success to date. The meeting opened with a panel of womanist academics including the Rev. Cecelia Armstrong, Rev. Dr. Emilie M. Townes, Rev. Dr. Kelly Brown Douglas, Rev. Dr. Gay Byron, and Rev. Dr. Eboni Marshall Turman. They embodied womanist scholarship done with attention to society, church, and academy. Such an all-star team (and I might add, there are many more such womanist scholars who could have been assembled) proves the breadth and depth of the scholarly work. 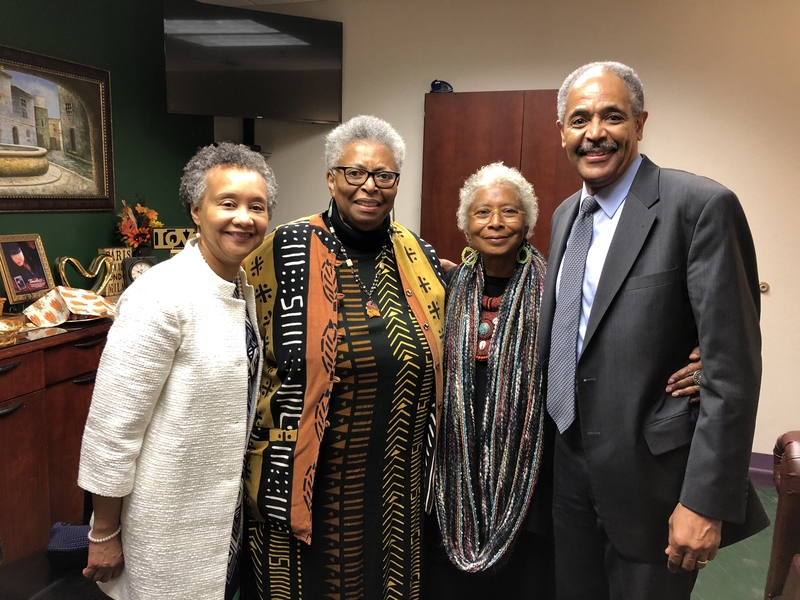 Dr. Cannon pioneered it as a brave and bright graduate student at Union Theological Seminary of New York where Dr. Delores S. Williams, whose presence was felt throughout the weekend though she could not attend, blazed the trail. From left, Cecelia Armstrong, Emilie Townes, Gaynell Sherrod, Eboni Marshall Turman, Gay Byron, Kelly Brown Douglas. By my count, womanist minsters made up the majority of participants. Their stories, told at tables and in casual conversation, revealed a brilliant quilt of lives dedicated to the service of the community via churches whether Baptist, Pentecostal, African Methodist Episcopal, Presbyterian, Episcopalian, or others. They sang every verse of most hymns with nary a hymnal in sight, strong voices soaring in praise. For a white Catholic, it was a sharp contrast to what I am used to — we are lucky to squeak out a verse or two, eyes glued to the pages. One minister at my table juggles two small children and the pastorate of a large church. Another aspiring pastor is in the business world but feels the pull to ministry so strongly that she can no longer ignore it; she will start seminary soon. Another sister is a pioneer in her denomination, the first woman pastor in a southern congregation that has had a long succession — many decades — of men in leadership. Womanist worship was suffused throughout the weekend. From the opening libations to the closing prayer, Dr. Melva Sampson kept a finger on the pulse of the group and offered worship accordingly. Dancers graced the center of the room, embodying prayer in myriad ways. Symbols and ritual actions made all of us feel included, responsible for the sacred space in which we found ourselves, and ready to take action following in the footsteps of those who went before us. Melva Sampson at the ritual table. Self-care was a common theme. The demands of ministry are real, but triple them at least for women of African descent in a racist world. Women shared what keeps them going and recharges them — running, meditation, music, supportive conversations between friends, for example. The arts were much in evidence in a bustling marketplace of paintings, jewelry, books, even health advice to keep us all in the struggle longer and better. An evening event that included music solos and poetry was a highlight. Table discussions over lunch allowed participants to choose a focus: preaching, fundraising, public policy, Post-Traumatic Stress Disorder, preventing burn out, children, and health, among a range of themes. I was part of a queer and queer-supportive group that looked at “Black LGBTQ Love Leading Us to Liberation.” The challenges of being ‘out’ in the church were shared. Mothers of lesbian daughters spoke movingly of supporting their daughters as best they could even if their daughters did not realize it. Carrying a word of liberation to the larger churches in which mothers are deeply respected is a womanist ministry. 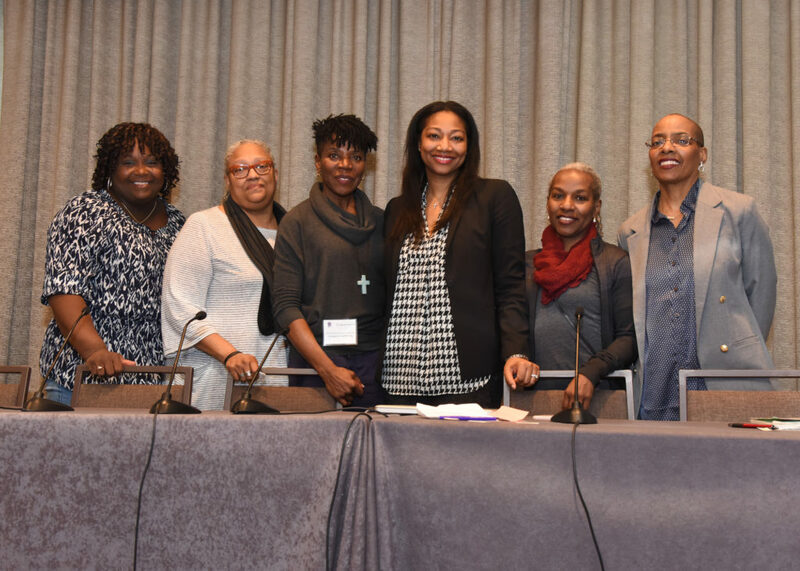 Gender non-conforming persons spoke candidly about their lives in the context of traditional black churches. As a white lesbian, I felt an abundance of respect for the truly difficult paths my siblings have to walk and a renewed resolve to be part of the anti-racist work needed everywhere to help smooth the rocky way. This was a multi-generational meeting. Young women heard the stories of their foresisters whose seminary scholarships supported not just them at school but their families at home. At the end, we all processed by and greeted Katie Cannon and Mercy Amba Oduyoye (with an empty chair left for Delores S. Williams), and received a blessing from them. There was a distinct sense that this work is in good hands. I went home not just inspired but committed. There was no romanticizing of difference or glossing over of the raw, bitter legacy of racism. While racism has never left us, it feels newly emboldened by the current administration. Womanists have their work cut out for them. As they lead, others of us pledge to collaborate for justice. All strength to them and all power to the Center for Womanist Leadership! Top photo, from right: Union Presbyterian Seminary President Brian K. Blount, Alice Walker, Katie Geneva Cannon, and Sharon Parham Blount. Mary E. Hunt is a feminist theologian who is co-founder and co-director of the Women’s Alliance for Theology, Ethics, and Ritual (WATER) in Silver Spring, Maryland. A Catholic active in the women-church movement, she lectures and writes on theology and ethics with particular attention to social justice concerns.